All the present maps are taken form the original government charts created by the Thai government, primarily created by the Navy and Marine Police in the 50's and 70's. These detail the coastline the mountain contours the reefs and rock islands. Copying the geography most present maps of Koh Phi Phi (as it is known in Thailand) have added the bungalows and villages. Now you can see in great detail where the Phi Phi Cabana Hotel is in relation to the pier, how far a walk it is from Phi Phi Don Chukit Bungalows to Long Beach. These are the main maps that you see on the many web sites and in the guide books. As Phi Phi has grown from a village of 3-400 people in 1974 to approximately 3500 people in 2003 each new season has seen a new more detailed map. In fact keeping up with the growth of the village will ensure that the definitive Phi Phi Island map will not come into existence for some time. Phi Phi Island Maps are so plentiful now that every few months, especially in high season, a new one arrives on the island. 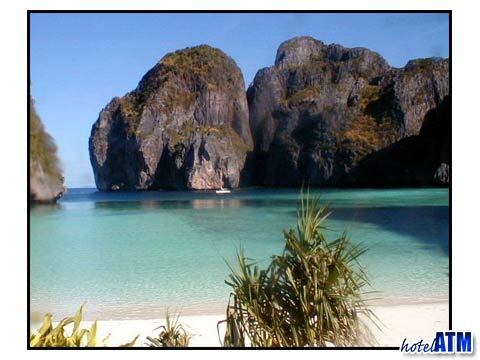 This is due to the phenomenon of advertising the small businesses on Phi Phi Don Village. 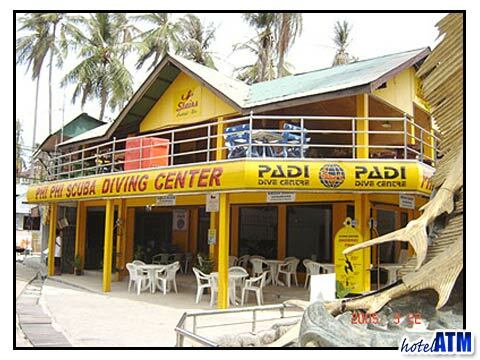 All these maps advertise the dive shops with courses, liveaboards, restaurants, kayaking, climbing and even rock jumping tours. As artistic interpretation fits all the advertising on to the space, some of these maps are better than others. Laem Tong; The northern, much quieter part of Phi Phi Don where the luxury resorts of Zeavola Phi Phi Resort and Holiday Inn Phi Phi Island are. We are still waiting fpor a good google map of Phi Phi Island as, as of now 2012, the key area of Phi Phi Don is covered with cloud. it has stayed this way since google maps covered the world. This website has added it's own map drawing over the top of the cloud.